Although I picked this skirt with Christmas in mind and Christmas is over, I still think it’s appropriate to wear throughout the winter months. I mean, plaid is timeless and so are stripes so why couldn’t you wear this outside of the Christmas season if you want to? 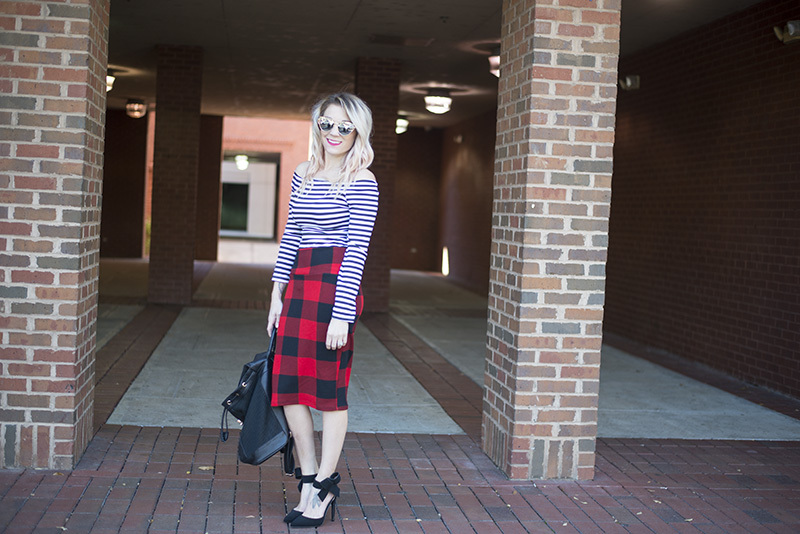 When it comes to pattern mixing, stripes and buffalo plaid is definitely one of my favorite combinations. So of course when I found this skirt, I knew I had the perfect striped top to match! These shoes will forever be one of my favorite pairs of heels; I mean, what’s not to love about bows on your shoes? I paired it with a backpack to give it a laid back vibe. But grab a sparkly clutch and this would be the perfect outfit for a night out or holiday party. I’ve linked similar options below! What are some of your favorite patterns and prints to mix? You certainly do know how to rock that style….It suits you and you make it work. I’m not so sure I could do this, but I will keep it in mind for future reference. Beautifully done pattern mixing right here. Love that striped off-shoulder top and the buffalo plaid skirt is a bit unexpected, but still so gorgeous! This is super cute! Love mixing patterns, it’s fun, chic and so stylishly fab! I love this outfit! I’m so fed up of my ‘Mum uniform’ of jeans and whatever top is easiest to breastfeed in. I need to go shopping haha! Girl, your outfits always look so gorgeous! I never would have thought of pairing these two prints but it looks amazing on you! 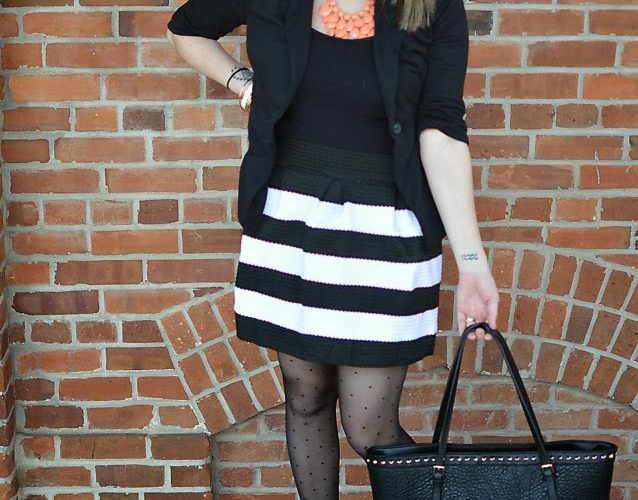 This is literally just PERFECT print mixing, Sam! I am in love with everything about this outfit.